Luva Hard with rigid supportis provided with an inner piece called a pressure distributor, which is its essential part. The pressure distributor eliminates local pressure of the guitar edge against the forearm, distributing the pressure along almost all of the inner surface of the forearm. 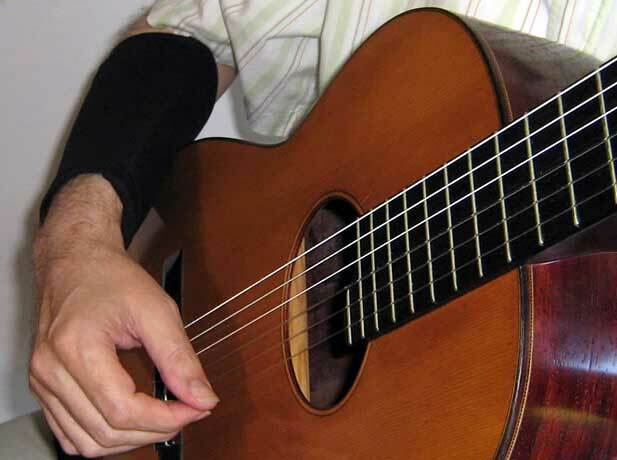 (The Luva Soft with soft support makes use of a rubber layer which allows a soft distribution of the arm pressure against the guitar edge). For the guitarists, who have a lot of arm pressure against the guitar edge, it is advisable to prefer the Luva Hard with rigid support.